Holland College | Gold medal chef prepares culinary delights for golden-agers! 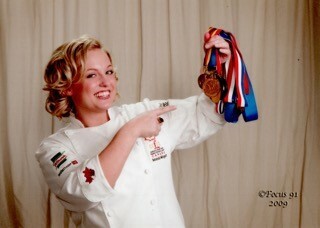 Home > Blog > Gold medal chef prepares culinary delights for golden-agers! You see, inside it is an array of desserts that visually stimulate the several 1,000 taste buds they all possess. Most of them know little about Mandy Wingert, the woman responsible for these enticing desserts but they should, because her background includes an impressive record of remarkable culinary achievements. What is so captivating to learn about her is that when she was only three years old in her grandmother’s kitchen in Regina, Saskatchewan something worthy of a delightful children’s book happened to her. It seems she had been watching her grandmother prepare a poppy seed strudel, a German traditional treat. But she had left Mandy alone for few minutes to take care of another task and the strudel dough had been left behind. It still needed to be stretched and pulled into a paper-thin consistency. When her grammy returned, she discovered her little granddaughter had somehow worked her little hands into the dough, finished preparing it for the filling, added the filling and rolled it up ready for baking. According to Mandy, her grandmother told her the strudel was wonderful when it was baked! Jokingly, she now likes to say, “I played chef as a child.” She does acknowledge that it wasn’t long before she recognized that it was her destiny to become a real chief and that’s what she has achieved! She was only a teenager when she was first exposed to the harsh realities of the culinary profession. This occurred when she apprenticed for four years at a restaurant known as the Mediterranean Bistro in Regina. At the time, people who worked beside her were intrigued by her obvious determination, despite working in a restaurant where, at first, she did basic tasks such as peeling vegetables. But this didn’t discourage her! Unfortunately, there wasn’t a culinary college in Saskatchewan but, after doing some research, Wingert discovered information about The Culinary Institute of Canada in Prince Edward Island. As a young student, she quickly recognized that the college offered a truly unique learning opportunity. It gave her great insight into why cooking has been described as both a science and an art. It wasn’t long before Wingert was demonstrating that she possessed the kind of skills necessary to transform food into mouth-watering creations. This became even more obvious during her years at the college, where she first earned her Culinary Arts diploma and a year later, her Pastry Arts certificate. To say the least, those three years at the college were extraordinary experiences for her. During this time, as part of Culinary Youth Team Canada, she and a team mate won four gold medals, a silver, and two Best of the Show awards at a culinary competition in in Grand Falls, Michigan. But there were even more impressive accolades to come. As captain of Culinary Youth Team Canada, she travelled to several countries including Wales, where her team won a bronze medal. Later, in Scotland, after four days of fierce competition, they were named the World Grand Prix Champions of 2007. Their next destination was Erfurt, Germany in October 2008 for the Culinary Olympics. For Wingert, this was an awesome competition because it was the biggest culinary exhibition in the world, with 54 nations and 1,600 chefs involved. Competition is stiff, and the days of preparation in advance of the competition acclimatizing themselves to a new kitchen were demanding. Wingert describes the grueling events that lasted for five days. She discloses that it was both physically and emotionally exhausting but, insists, it was so rewarding to win a gold and silver medal, especially when they were competing against 50 different countries from around the world! Hans Anderegg, who is a chef instructor at Holland College’s Culinary Institute of Canada and the team coach, was obviously very pleased with Mandy’s performance as captain of the culinary Olympic team. “She was an exceptional team leader. Her enthusiasm and work ethic really helped pull the team together,” he says. Wingert, like other culinary graduates, has had to face the prospect of dealing with the complex issues associated with working as a chef at a very busy location. For a short time, she worked at a famous British restaurant known as the Fat Duck. There are reports that Prince William and his wife Kate have dined there. She also encountered a rather unsetting scenario when someone had promised her a top-rated job at a very good restaurant in Wales, but it didn’t work out. After returning to Canada, she acquired two Red Seals in both cooking and baking. The Red Seal is a prestigious, nationally recognized designation recognizing broad culinary knowledge, skill, and years of experience. After exploring several options that clearly were appropriate for her outstanding culinary qualifications, Wingert decided to move to Halifax in 2011. She worked, for a short time at a well-known hotel in the city. A colleague at that hotel, who soon truly admired her remarkable culinary skills and especially her delectable desserts, one day made a fascinating suggestion. There are, of course, some individuals who may ask if working at a residence where seniors live wouldn’t be a rather dull environment for a dynamic young woman like her. She immediately dismisses this kind of thinking. Such very positive comments, she insists, are almost as rewarding as having a medal hung around her neck!